The U.S. Air Force Research Laboratory and contractor Aerojet Rocketdyne achieved a major milestone under the Hydrocarbon Boost program, which is advancing domestic rocket engine technologies in support of next generation launch. 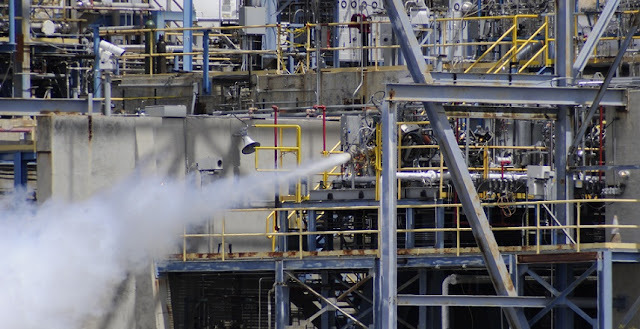 The Hydrocarbon Boost (HCB) program completed full power, full duration tests of the oxygen-rich staged combustion (ORSC) sub-scale preburner. Testing was conducted at the historic rocket Test Stand 2A at Edwards Air Force Base; the facility was first utilized to test the F-1 engine used to power Saturn V rockets in the Apollo program to reach the moon. The sub-scale preburner test campaign accomplished the first demonstrations of several key rocket engine technologies, including the first use of Mondaloy 200 superalloy in a rocket engine environment and the first operation of a diluent type preburner. Demonstration of Mondaloy 200, which was co-developed by Aerojet Rocketdyne and the AFRL Materials Directorate, was a critical step to proving the unique combination of high-strength and burn resistance necessary for hardware survival in the harsh ORSC rocket environment. "These tests are a significant milestone for our program, but also just the beginning of an effort to develop and transition the tools, components and knowledge needed for our customer and the U.S. rocket industry," said Dr. Shawn Phillips, chief of the AFRL Rocket Propulsion Division. The U.S. has a limited technology base in the high-performance ORSC rocket engine cycle. The United Launch Alliance Atlas V launch vehicle is powered by Russian RD-180 rocket engines, which were developed based on decades of ORSC research and development in the former Soviet Union. Tensions with Russia spurred limits on future use of the RD-180 engines for national security launches and triggered increased U.S. government investment in ORSC technology for industry to use to provide future launch services for National Security Space launch needs. A key goal of the Hydrocarbon Boost Technology Demonstrator is to mature the technology readiness of ORSC engine components to advance the U.S. rocket technology base. This is also a key goal of the Booster Propulsion Technology Maturation (BPTM) projects led by the Air Force Space and Missile Systems Center at Los Angeles Air Force Base. "The DOD is absolutely committed to transitioning off the RD-180 as quickly as possible, while ensuring no impacts to national security. Programs such as BPTM are essential to achieving that objective while solidifying U.S. assured access to space and supporting the U.S. launch industry's viability in the global market," said Lt. Gen. Samuel Greaves, SMC commander and Air Force program executive officer for Space. Technology maturation and risk reduction efforts are part of a comprehensive Air Force plan to transition off of the RD-180 engine. One of the BPTM project areas is to advance technology readiness through critical rocket engine component design, integration, and test. To this end, SMC augmented HCB program funding to accelerate development of the HCB full-scale preburner and enable near-term U.S. demonstrations that are critical to overcome key ORSC challenges. These critical ORSC challenges include combustion instability, oxygen compatibility of materials in severe high pressure and temperature environments, and complex preburner startup and shutdown transients. The improved knowledge base, test results, and lessons learned in the HCB program and other BPTM activities are shared with the entire U.S. rocket propulsion community. "An objective of this program is to help eliminate the United States' reliance on foreign rocket propulsion technology," commented Maj. Gen. Tom Masiello, AFRL commander. "This is key to ensuring our national security, and the people of the Rocket Propulsion Division are making impressive strides in achieving our goal." The highly instrumented HCB sub-scale preburner tests generated critical data for design and development of the full-scale preburner. Design and fabrication of the full-scale ORSC Hydrocarbon Boost preburner is underway. Preburner component level testing will be conducted at NASA Stennis Space Center prior to Hydrocarbon Boost integrated engine testing at AFRL in the 2020 timeframe. Successful program completion will demonstrate national goals for the Rocket Propulsion for the 21st Century program, which is co-chaired by the Office of the Secretary of Defense and NASA.